There's still more than a month of summer to embrace so WavesGear is offering a site-wide, 50% discount to Gizmodo readers which includes their versatile, extra-large Micro-fiber towel, now only $15. Use promo code Lifehacker50 on the second page of checkout. Towels are an obvious necessity, and even more prevalent in the warmer months, and this extra-large micro-fiber towel offers more functionality than the everyday cotton towel. Specifically, the innovative towel dries twice as fast and takes up 78% less space compared to a cotton towel, while covering more surface area. 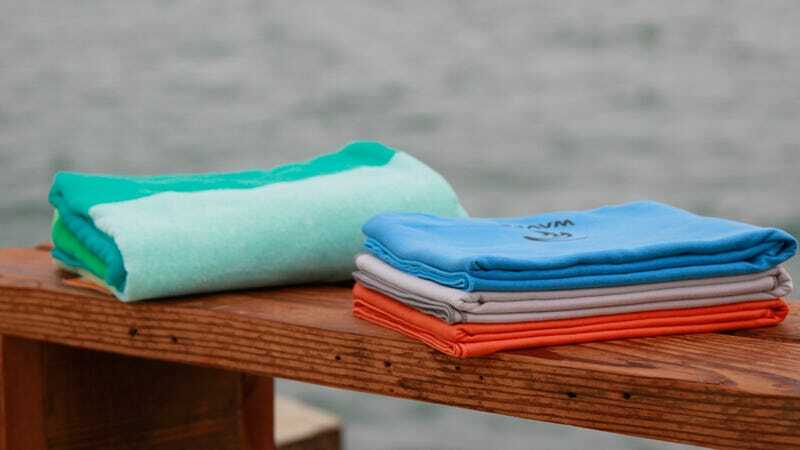 Whether you're a casual sunbather or a triathlete, the towel is great for any location or activity - the pool, beach, park, gym, yoga, hiking, camping, or traveling. Towels are available in blue, grey, and orange. The extra-large micro-fiber towel (36"x60"): $30 $15. A 3-pack of extra-large micro-fiber towels: $70 $35. There's also a medium micro-fiber towel (27.5"x55") for $12.50, a medium for $30, and even floating, polarized sunglasses for $20, to round things out. And remember, use promo code Lifehacker50 on the second page of checkout.